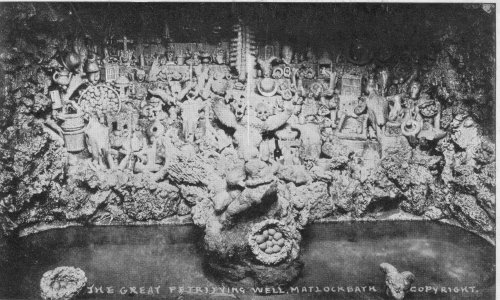 Petrifaction, Petrification, Petrifactioners and Petrifying Wells were big business in Matlock Bath between 1800 and 1900. Every-day objects were turned to "stone" for the amusement of tourists. The Royal Museum was one of the largest (see coloured postcard, perhaps taken in 1890). A sign ouside reads "The largest Principal Petrifying Well in Matlock". Margaret Howard sends the interesting article below, dated 1868. 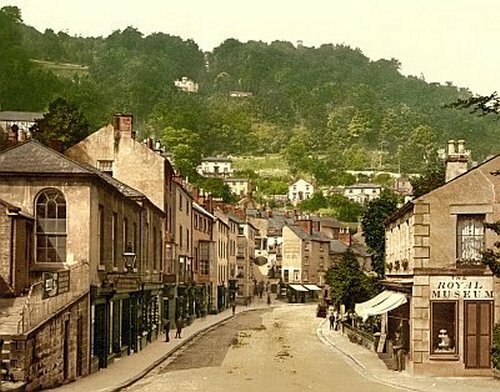 The Royal Museum, South Promenade, Matlock Bath, from a postcard possibly taken 1890. Another postcard, posted 1904, shows a large sign on the right of the Royal Museum which reads "The Largest Principal Petrifying Well in Matlock"
From a postcard, unused. A host of articles left in the well to become covered with water scale, and so "petrified". Most are unrecognizeable, but I have spotted: a bottle, bowler, basket of eggs, kettle, cross, and sheep's head. it's rock shops etc. that I thought might be of interest to the List. considerable extent. On the parade there are several spar shops, or "museums,"
establishment we paid a visit. [See Petrifying Well and Museum]. may also be enumerated as among the objects of interest in the exhibition. despite the rather misleading quotation from James Croston. several spar workers did own petrifying wells as a side line. which makes this same mistake. are also three petrifying wells. being within a short distance of each other. where the beauties of the Dale are seen to the best advantage. honour of Tutbury, and forms part of the Duchy of Lancaster.